No secret that notebooks keep on increasing their share on the market. There are two reasons for it - improvement of their speed and functional properties, thanks to which notebooks have caught up with desktop systems, and falling average retail prices for portable systems. At the same time, there are a lot of people who have to save, and notebooks don't suit them because of the price/performance ratio+capabilities. 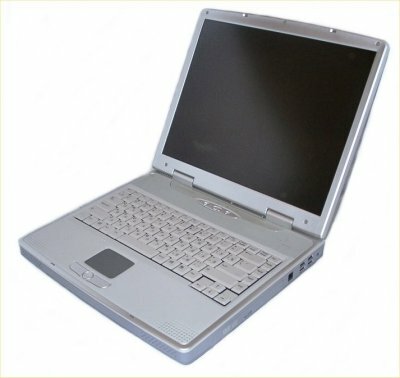 A portable computer is approximately twice dearer than a desktop system with the same parameters. That is why some have to give up portability for the sake of the price. 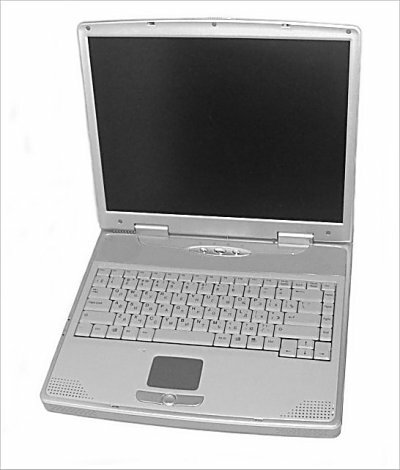 Most notebook makers are entering this market by producing inexpensive models aimed at the budget market, for example, R31 from IBM, XE3 from Hewlett-Packard, Presario 900 from Compaq (though, this is HP as well). But the manufacturers stick to the conception that a notebook must be portable, and they stake on mobility (as well as the price in case of a budget solution), while the rest of the components are simply supplemented. It also relates to high-performance systems which use powerful batteries and mobile components (except a processor). However, such situations when a computer works from a current network and is taken from one place to another (for example, from work to home) become more common. In this case it would be logical to save on a battery and other unnecessary mobile components (with the same performance). Besides, it's also cheaper to use desktop components. So, today we have one of such solutions developed by Elitegroup Computer Systems (ECS) - Desknote i - Buddie 4 for the Intel Pentium 4 platform. The key difference of the Desknote from a notebook is a lacking battery; the desknote can work only from an external power source (or an external optional battery). 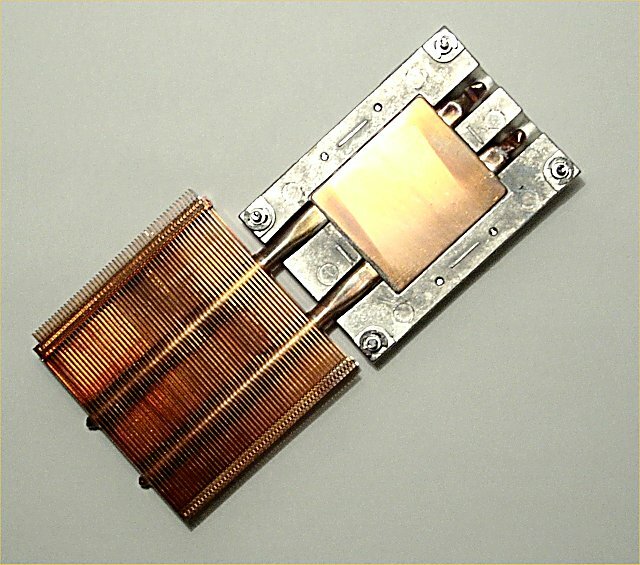 This approach allows to do with cheaper computer components, which, in its turn, makes the system cheaper and more efficient. However, the problem of overheating can become more pressing. Whether it's so or not we will discuss later, and now look at the components and accessories. The Desknote ships in a cardboard box with a big logo on its side (I also saw a white box instead of the typical cardboard color, which looked much more pleasant). Inside there is the desknote in foam plastic to fix the computer and a small box with accessories. Installation manual. With VD with Thizlinux 6 (adjusted for Desknote). It's a very good solution - those who don't need an expensive operating system, can use this one; otherwise, they can go and buy it. Transformer and power supply cable (transformer from LiteOn). Telephone cable with a strange connector. S-Video extender. S-video - RCA is lacking, though it would be useful. Built-in two high quality stereo speakers with chamber and mic. As a rule, the Desknote ships without a processor, hard drive and DDR. However, there is a PROMO version with these components installed (it will be discussed in the next article). The processor is standard: it's a usual desktop Pentium 4 with the Socket 478 connector. The RAM slot is only one, but standard (desktop), that is why the cost is much lower and the capacity is greater. The hard drive is quite small (2.5"), but such drives are rather widespread. Installation of all the components is simple, it can be done even without the Guide. But note that you need a thin cross-head screwdriver. Now look at the side panels of the desknote. In front it has no connectors, only the latch and speakers. On the left it incorporates the FireWire IEEE 1394 and power supply connectors. Behind: network (RJ-45), S-video, external monitor, LPT, IR, mic-in and headphone jack (though I wish two latter connectors were placed on the side panel). On the right: 4 USB 2.0 ports and DVD-CDRW drive. The location of the USB ports is really handy for attaching external devices (for example, USB drives). The chipset and other components are cooled down a typical way: the fan takes air from below and throws off hot air to the left. The processor has a very good cooling system with a separate fan which drives in air from above (there is an air vent above the keyboard on the left), passes it through a copper heatsink (which is connected with pipes containing coolant with a plate that removes heat from the processor) and throws it off to the left, downward and backward. It's almost impossible to block the exhaust (and it's questionable where air should come from when the panel is closed...). On the whole, the cooling system is quite effective. Controls: a full-size keyboard (which IS a drawback typical of notebooks: the block of keys which in a usual keyboard is located above the cursor keys is arranged not the best way) and a touch pad with two buttons and a two-way scrolling one. Besides, there are two soft keys next to the power supply button - one for browser, the other for post client. LEDs: two indicators (power and sleep mode) on the left panel (they can be seen when the panel is down) and 4 indicators on the left panel - HDD LED and standard ones (scroll, num and caps lock). In the tests the desknote was supplemented with the following components: Intel Pentium 4 processor, PC2100 512 MB memory and IBM 40 GB hard drive. Two systems run in parallel: Windows Millenium (Me) and Windows XP. The most part of time I worked and run the tests in Me (for the tests the system was reinstalled). In the WinXP I checked whether the drivers were installed and worked correctly. The problem in the tests is that the results depend on what configuration you choose taking into account that the processor, memory and hard drive are not included in the very beginning (Celeron 1800 or Pentium 4 2.4, 128 or 1024 MB, a fast or slow hard drive). I ran some tests anyway (3Dmark 2001 and Sysmark 2002) and tried to compare the results with the Asus L3 notebook which has similar parameters. Well, the Desknote is a bit more efficient. However, the comparison is not very correct because the Asus L3 has a more powerful CPU (desktop P4 2.2 GHz on i845MP) and a stronger video card (Radeon-M 7500 32 MB), and twice less memory (256 MB); besides, the scores are obtained in different operating systems - Asus was tested in the WinXP, Desknote in the Win Me. But the performance of the systems is approximately the same. 3Dmark 2001, with 32MB reserved for video, demonstrates about 1000 scores. With 64 MB for video, it results in 1440 scores. It's clear that the video subsystem is a bottleneck here. As for other aspects of performance, you can get an idea on them from other articles dealing with the SiS 650 and integrated video of this chipset. This is a key part of the review because it's possible to bear with inferior performance (especially because it's not always possible to estimate it objectively), but not with defects in the ergonomics. Should we compare the Desknote with a desktop computer or a notebook? It's a complicated question because some requirements for notebooks (small dimensions, long operating time) are inapplicable, and at the same time it would be nice to have speed and handiness typical of desktop systems. As the Desknote is a substitute for a "big computer", the requirements for ergonomics must be appropriate. That is why I tried to estimate how good the Desknote is as such substitute. It's not very convenient to compare it with a notebook because they look similar when used at home and work, and the Desknote doesn't work in between (I didn't consider an external battery). Besides, the aims when choosing a notebook are a little different, and it's easier to decide to a Desknote instead of a desktop than instead of a notebook. I liked the general design. I got the desknote with a silvery lid which looks quite pleasingly. The case is pretty nice, and during operation I had no problems. However, there are some minor downsides, like the upturned USB ports, - thus, the flash drive indicator was "looking" downward. Besides, it would be nice to have at least one PS/2 connector in case a user would like to have its own mouse and/or keyboard. The power supply and modem connectors are on the different panels which is not convenient to take the system to another place. The lid is quite soft, and you might cause distortions on the matrix if you press it. That is why you better not allow you cat to sit on it :). I like the Desknote inside as well, however, it's my own opinion. The keyboard leaves a pleasant impression as well. The keys are soft, it's easy to press them, and the key stroke is deep. The keyboard is even more pleasant than many desktop models. The keys Ins/Del are in bad places, and it's a pity that the ctrl button is replaced with Fn. However, most notebooks suffer from the same problems. The touch pad works nicely, you can even program it for certain operations (display a window, stop downloading in a browser etc.) with the software supplied. But the buttons of the touch pad are awful: they move, produce terrible clicks and are hard to press. The matrix is not that bad, though it's not the latest generation. The side viewing angles are good, in contrast to the vertical ones. The lighting in the lower part of the display is greater than above. Besides, the vertical viewing angles are quite small. If you bend it a bit forward, all the colors will turn into gray; a bit backward - and the upper part will become black and the menu items won't be readable. Thankfully, the matrix can be turned at any angle, but anyway, it's not a wayout to turn it up and down time and again. Besides, it's not convenient to watch movies - the black color turns into negative very quickly. On the other had, in two weeks I got used to it and paid no more attention to this problem. By the way, the tested model had a 15" matrix of 1024x768 pixels (14" panels are possible as well), which seems to be the most optimal resolution for a notebook in my opinion. The video part is based on the integrated SiS 650. That is why you shouldn't expect much from this subsystem (the 3DMark proves it). The chips, however, copes excellently with 2D graphics. The TV-out supports 1024x768, but the quality is worse compared to the NVIDIA GeForce 4 MX (reference from NVIDIA). The picture is a bit blurry and flickers (it couldn't be eliminated in the Me, though the function is provided. The same situation occurs in the XP). On the external monitor the image is not very sharp either. The settings of the monitor and TV-out management utility are simple and handy. You can choose any two displays and also easily switch from primary to secondary. The Windows itself doens't recognize the second monitor, though everything works flawlessly. If you connect external devices to the turned off Desknote, it will start playing tricks like switching to the clone mode, disabling the matrix and displaying the image on the external monitor (it' not convenient when you use the TV-out as the blurred desktop is displayed on the TV), and you have to resort to the settings to change the things back. However, the experiment wasn't finished: during the work with different dual-monitor configurations the video drivers failed in the Windows Me. After rebooting, the video core was found, but the additional functions from the Windows were disabled (so, it was impossible to set a dual-monitor configuration or activate the TV-out); the attempt to reinstall the utilities failed. After that I couldn't make the system work with two displays at all. The speakers cope with their functions. The sound is as if from a barrel, and there is a shortage of the lows, but the stereo effect is noticeable. The DVD-CDRW works OK, just a little bit noisy. However, I didn't hear it when it was standing next to a desktop system with several fans. The fact that the Desknote is equipped with the Combo Drive is already an advantage. The CPU's fan works constantly but quietly. It seems to me that its speed doesn't depend on temperature which hovers around 35-53 degrees in the tests (the highest temperature was reached 2 hours later after the DivX playback). In the standard mode the upper panel and keyboard do not heat up much, the lower part gets just warmer. But if you block the underneath air vents, the lower part will heat up very quickly and make the keyboard warm. I couldn't overheat the computer. Note that it's not the processor that heats up - its area is the coldest one, but warm areas are distributed along the bottom. The Desknote works very quietly - you can hardly hear the fans working even in the quietest room. Besides, the noise is always overdone by external sources. The optical drive is a bit too loud, but it's a typical shortcoming. In the Windows XP the computer "fell asleep" and woke up correctly and always reacted to closing the lid. In the Windows Me, the system fails to quit one mode (standard, probably S1, as the fans keep on working), and to enter another one (Hibernation). But it can be a software problem. I don't understand where the sleep modes are set. With the declared S3 support the Desknote goes to S1 and doesn't disable the processor, i.e. the fan must work though the closed lid prevents air intake. Imagine a situation when employees work both at home and in office and have a free schedule. Isn't it quite common? The number of companies with such approach will keep on growing. How to provide the best work conditions in this case? The company can buy computers for all the employees for home use and provide some portable storage devices. It's a cheap solution, but users will have to keep all files on removable storage devices all the time and must never forget to take them to home and back. Another variant is to buy notebooks for all the workers. This is the way rich companies go. But, firstly, not all firms can afford it, and secondly, despite a high price, performance of a mobile solution is lower than that of a desktop one, not to mention expandability. Besides, such notebooks will take power from the current network most of the time, and mobile features which affect the performance and price, won't be made use of. The system we are testing today can be a very good choice in this situation. At the same time, apart from the office use, the Desknote has certain advantages over a desktop system and when used at home. So, what are they? First of all, portability. You can work wherever you like. Besides, the Desknote is much quieter than any standard desktop system (by the way, one of the ways to get rid of loud squeak during the BIOS checkup is to jack in headphones before rebooting). Secondly, it doesn't occupy much space. It takes much space even than a standard keyboard, mouse and an LCD panel (not to mention CRT). Once you finish the work, you can put it into a drawer. It takes just a few minutes to get it packed. However, a usual notebook would suit as well, right? Right, but will you calculate the price for a notebook with similar parameters? And here, in exchange for the battery (which in new mobile P4 based systems, especially in case of desktop P4, plays mostly a decorative role) you get an approximately same system ("approximately" because the components are still simpler there) at the price of budget notebooks. The price of the tested configuration is a tad over $900. Add $100 for missing parts (processor, HDD and RAM) and you will get a normal system at approximately $1200-1300. It's for you to compare with similar desktop systems, just take into account a rich set of components (including DVD, CD-RW, modem, network adapter etc.). Such computer will be a good add-on for a main system if, for example, your kid is playing a game and you have to work. So, the ECS Desknote is an inexpensive machine that combines advantages of a desktop computer and a notebook. Certainly, it has some downsides (they are covered in this article), but they are made up for by its rather low price and notebook components. If you think that a notebook would suit you, but you need high performance at a lower price and sockets are usually within sight, the Desknote line can be the best choice. The tested model is top in this line, and it's meant for those users who are ready to pay a little more for a really rich set of functions. Whether you need DVD or DVD/CDRW drives against a usual CD-ROM one is for you to decide; I just must say that a user is given a choice, which is a really good thing.